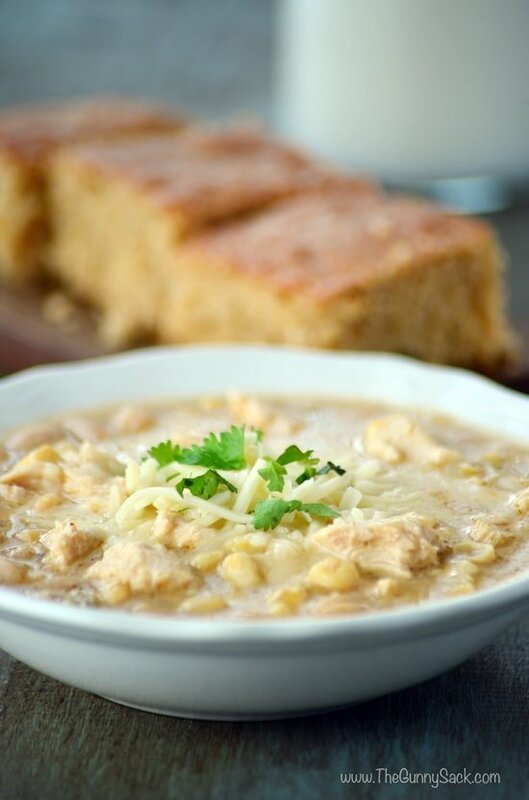 This Slow Cooker White Chili with Chicken with chicken and white beans is super easy to make in a crockpot and is the perfect family dinner for busy weekdays. Things have once again gotten really busy! When things get busy, family life still goes on. Everyone needs clean clothes, dishes need to be washed and everyone needs to eat. So, I pulled out my Crock Pot and made White Chili with Chicken! It cooked all day yesterday while I worked. Meet my vintage Crock Pot. I believe we received this as a wedding gift 19 years ago and it still works great. I was going to use my red Crock Pot that you’ve seen in many of my slow cooker blog posts, but when I pulled it out I noticed that there was a crack along the bottom of the stoneware piece. So, out came the trusty green Crock Pot! Melt 3 tablespoons of butter in a large saucepan. Add minced garlic, dried chopped onion, diced green chilies, cumin, chili powder, oregano, pepper, and salt. Cook for a couple of minutes. Stir in flour and cook for a couple of minutes while stirring. The mixture will clump together. Stir in chicken broth until the flour mixture has dissolved and then stir in the milk. Put thawed, boneless, skinless chicken breasts in the bottom of the slow cooker, top with a can of drained super sweet white corn, and 2 cans of drained and rinsed great northern beans. 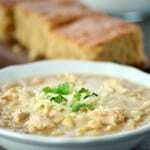 Pour the broth over all of it and cook the slow cooker white chili chicken on high for 6-8 hours. After about 5 hours, cut the chicken into bite-sized pieces and return to the Crock Pot to finish cooking. 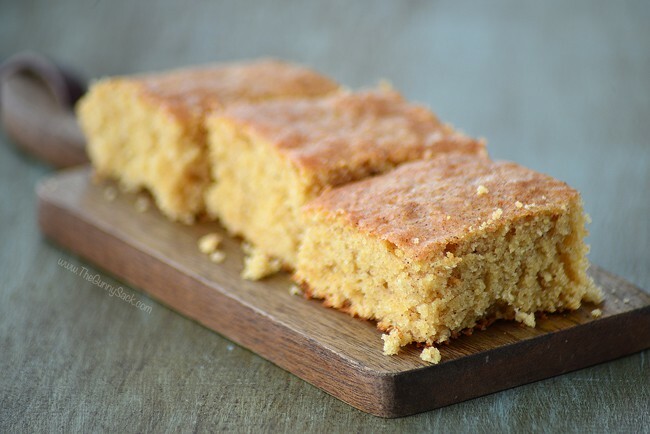 To go along with the white chili, I made some of this Cinnamon Sugar Cornbread. I topped the slow cooker white chili with chicken with shredded Monterey Jack cheese and cilantro. I put the leftovers into small containers in the freezer so that I can warm it up for lunch! 1. What size crockpot should I use? 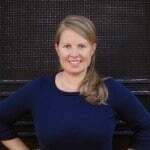 My vintage crockpot that I used in this blog post is the 5-quart size. 2. How can I turn this into a freezer meal? Although I’ve never made freezer meals, the standard directions would be to combine all of the ingredients for this chili in an airtight container (often a gallon sized ziplock bag) and store in the freezer. Remove the container from the freezer to thaw for 12-24 hours before cooking in the slow cooker. 3. Do I have to drain and rinse the bean? I always drain and rinse canned beans. The liquid in the can often contains additional starch and salt which rinsing will help remove. It can change the color, texture and nutrition of the dish. That being said I’ve seen other chili recipes that don’t require rinsing so it is up to you. 4. What other toppings do you suggest? Try stirring in a cup of sour cream before serving. This slow cooker white chili with chicken would be delicious topped with diced avocados, sliced green onions, sliced green peppers, diced tomatoes, tortilla strips, or Fritos. What other slow cooker recipes for soup do you suggest? Slow Cooker Taco Soup by The Gunny Sack: This Slow Cooker Taco Soup recipe is so easy to make and so flavorful. Just brown the meat, put everything in the crockpot to cook, and then just stir! Crockpot Lasagna Soup by Spend With Pennies: CrockPot Lasagna Soup is the perfect weeknight dinner! In this easy recipe, the slow cooker does all of the work to bring the goodness of lasagna and the comfort of soup together into one amazing meal. Slow Cooker Chicken Pot Pie Soup by The Gunny Sack: This crockpot recipe for Slow Cooker Chicken Pot Pie Soup is hearty dinner idea for chilly nights. Serve with puff pastry breadsticks instead of pie crust! Slow Cooker Broccoli Cheese Soup by Well Plated: Calling all Panera broccoli cheese soup lovers! Here’s a healthy recipe for an easy Slow Cooker Broccoli Cheese Soup that takes less than 10 minutes to prep. 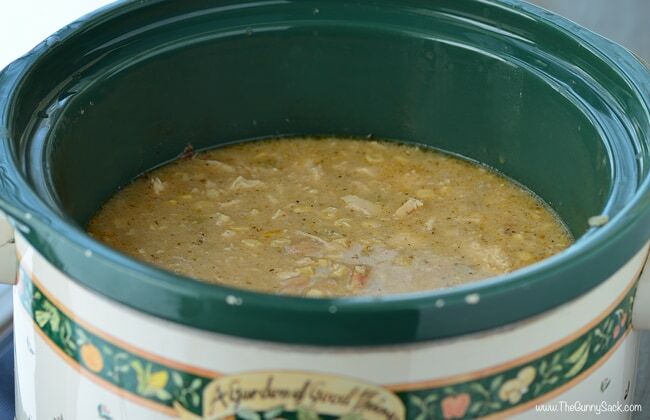 Slow Cooker Corn Chowder by The Gunny Sack: Slow Cooker Corn Chowder Recipe is a comforting combination of corn, potatoes, and ham. This easy crock pot recipe is perfect for a family dinner! Melt 3 tablespoons of butter in a large saucepan over medium high heat. Add minced garlic, dried chopped onion, diced green chilies, cumin, chili powder, oregano, pepper and salt. Cook for a couple of minutes. Stir in chicken broth until the flour mixture has dissolved. Put boneless, skinless chicken breasts in the bottom of the slow cooker. Top with corn and great northern beans. Pour the broth over all of it and cook on high for 5-6 hours or low for 7-8 hours. After about 4 hours, cut the chicken into bite-sized pieces and return to the Crock Pot. My husband and I LOVE this recipe. I’m working on a months worth of freezer meals to prepare for the arrival of our second baby. How would you recommend I turn this into a freezer “dump” meal? Just found your recipes and can’t wait to try them they all look so tasty – my question is what size crock pot are you using? I only have the gigantic 6 quart to feed my family of 6. The recipe I used in this post was a 5 quart size. Happy Crocking! Hi! I was wondering about how many serving sizes were in this? Thanks! It makes about 6 servings. Enjoy! Hi there, I have this in the crockpot right now and cannot wait! Just one question, even though it’s too late since it’s already going. I’m assuming you don’t drain or rinse the beans or drain the corn? Thanks for the recipe! Sorry, I’ve been gone all day and just saw your message. I drained and rinsed my beans, but other recipes I’ve seen online did not, so you should be just fine. I have that in the blog post, but forgot to add it to the recipe at the bottom. The corn I bought didn’t need to be drained. I hope you enjoyed it! Ok, so why haven’t I been invited for supper yet?! I looove white chicken chili….the rest of my family, not so much, but I can make what I want sometimes, right? Anyway, i’m definitely going to try this recipe out! Since my family doesn’t really like it either, we will have to have a ladies lunch! Thanks Shanette! Can I use leftover chicken? If so when should I add it? I would make it the same way, by putting it all in at once, and just cook it for less time. Love me my crock pot! It’s my best friend most days especially if there was this amazing Chili in it! 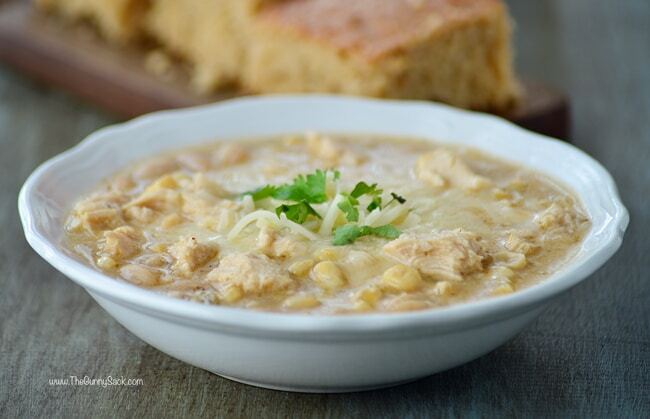 White chicken chili is one of my faves….I haven’t made it in a while, though. I will have to pull out my slow cooker and try your recipe!! Nice recipe. Thank you and have a Happy Wednesday. My crockpot looks very similar and it’s still going strong! I love chili, perfect for busy nights because I can usually get two meals out of it! I have to pin this for sure! Crazy how the 20 year old Crock Pot is still around and the one that is only a couple of years old not only cracked but also lost the handle awhile ago! Am I overlooking it, or it the amount of flour not listed in the ingredients list? Winter has always been the perfect time for chili. The great northern beans you mentioned are those garbonso Beans? Reason I ask is because that is what they look like. 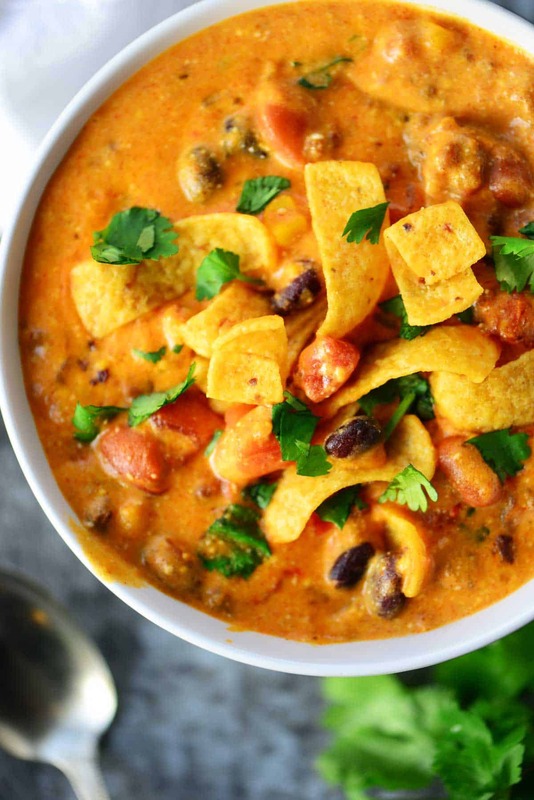 Your chili looks awesome just like every thing else that you post to share with us. Thanks Anna! From what I understand, great northern beans are white beans and garbanzo beans are chickpeas. Gosh this chili is calling my name. It is perfect on a cold day. Thanks Jocelyn! When I brought the kids to school this morning, it was 29 degrees and then I found out that was the high temperature of the day! Darn! Sounds delicious but you mention adding flour in but I don’t see the measurement amount, is there one? Thanks. Sorry! I forgot to add it. Thanks Carol!